Half way through the week! Woohoo!! I can’t wait till Friday, we have our work Barbecue and then I am on vacation. It’s going to be wonderful not having to go to work, sleep in and just have fun. The only problem is I can’t believe it’s August already! Where the heck did the summer go? I already noticed that the sun is shifting. When I come home from work, my lounge chair is normally in the sun, but this past week it’s been getting half way shaded. I don’t like that, I’m not ready for summer to come to an end, it feels like it just begun! Ready for today’s recipe? I am just loving this one!!! 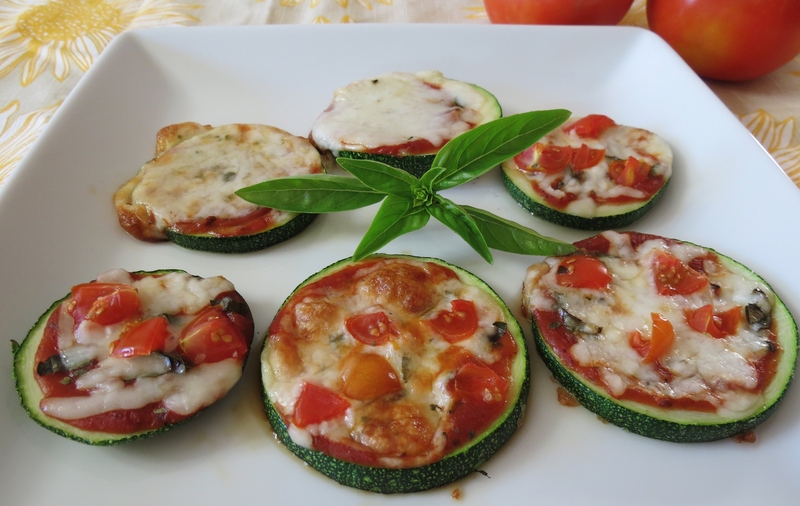 These are my Grilled Zucchini Pizza’s. They are so quick and easy to make, tasty too. I made mine with tomatoes and pepperoni for my Hubby. He’s not a fan of zucchini, but he loved these. I asked him would you eat these again and he said yes. Hey that’s a huge step for him. I guess if I put pepperoni or bacon on anything, he’ll eat it! These pizzas took about 5 minutes to make and about 5 minutes on the grill. It’s been so hot that I refuse to turn on the oven. However you could cook these in your broiler if you prefer it over the grill. I used an 8 Ball Zucchini, which is a zucchini about the shape and size of a softball. I sliced it about 1/4″ thick, added the pizza sauce, fresh basil, oregano, mozzarella cheese and topped it with sliced cherry tomatoes. I placed it on a non-stick aluminium foil and placed it on the grill over low heat and cooked it until the cheese melted, which was about 5 minutes. This is truly a wonderful, yummy tasting dish. I think it’s my favorite way to have zucchini so far. Having zucchini as pizza is so good that I don’t even miss the bread and either did my Husband. I really am happy he liked them. 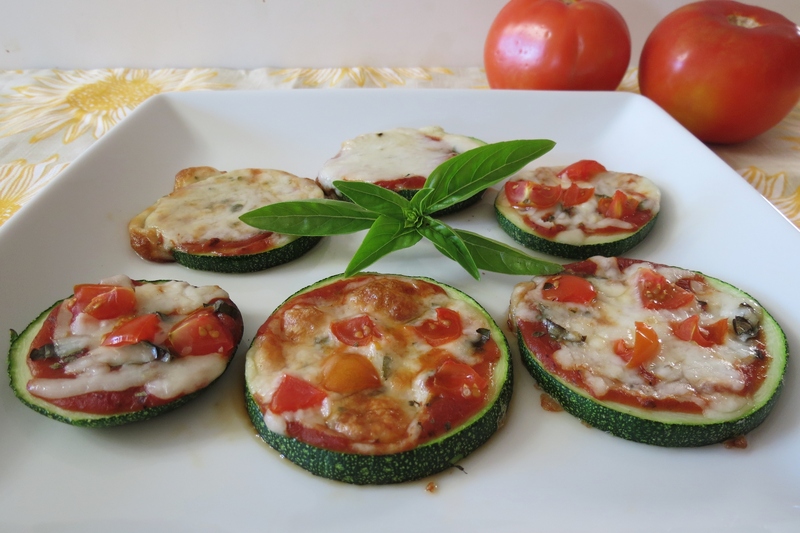 Zucchini Pizza is a healthy alternative to traditional pizza made with zucchini, pizza sauce, fresh basil, mozzarella cheese and cherry tomatoes. Cut the ends off of the zucchini and discard. 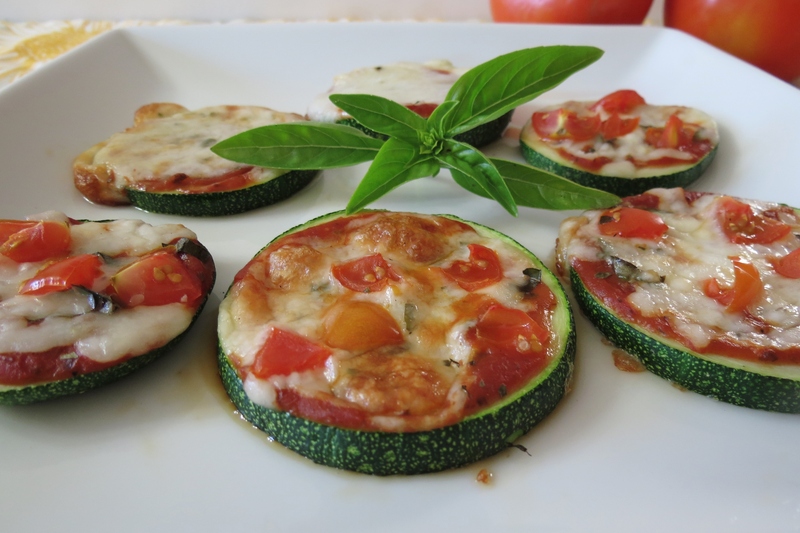 Slice the zucchini into ¼" thick pieces. 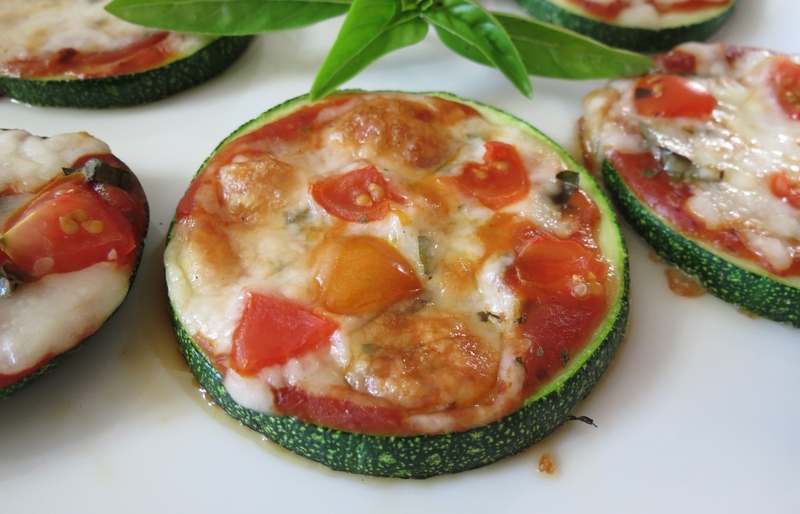 Evenly divide the pizza sauce over the zucchini, then top with basil,oregano, cheese and cherry tomatoes. Place zucchini on a non-stick aluminum foil or aluminium foil sprayed with cooking spray. Place foil with zucchini on grill over low to medium heat. Cook until cheese has melted, about 5 minutes. I hope you like today’s recipe, honestly I am really impressed with them. They tasted way better than I thought they would. The key is to use the pizza sauce that you like. We used Trader Joe’s jarred pizza sauce. That is a family favorite! I have a feeling I will be making these again this week. I have Five 8 Ball Zucchini’s to use this week, and since my Husband likes them, I will for sure make them soon! What a wonderful, pretty idea Jennifer, I love this! Yummy! I have made these with eggplant before. these look wonderful! These would be fantastic with eggplant! This is perfect for all of the zucchini I have! I love zucchini and I buy some every week I go to the farmers’ market because I go through it so fast. I’m excited to try this one! I love zucchini too! Glad I got my Husband to eat it! Such an amazing idea, I am definitely making this! 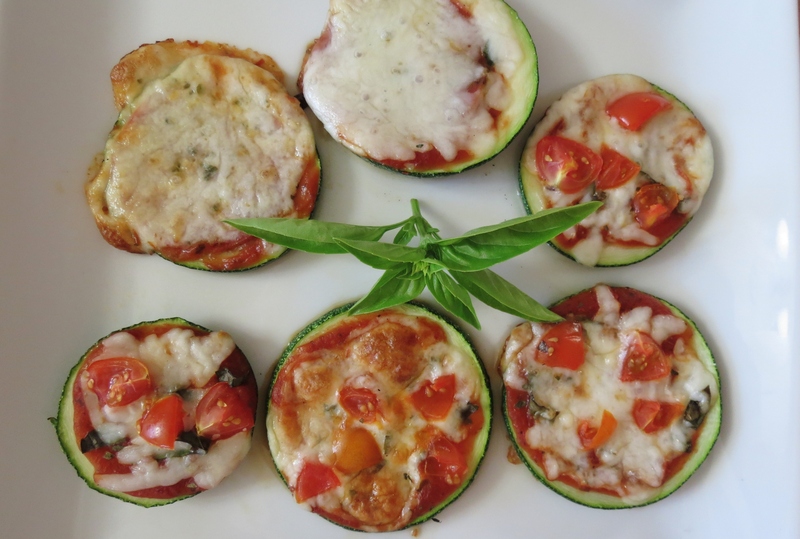 It saves a lot of calories, and probably the zucchini add so much more flavor! The zucchini is so good and does add alot of flavor! Sounds like a great way to eat pizza and not feel guilty about it! I make these ALL. THE. TIME. They are so healthy and tasty. There so good aren’t they!! this is so perfect since we have a HUGE amount of zucchini right now from the garden..im making zucchini brownies tonight..ill definitely try these though they look great! Ohhh, zucchini brownies sound good, hope you post the recipe!! 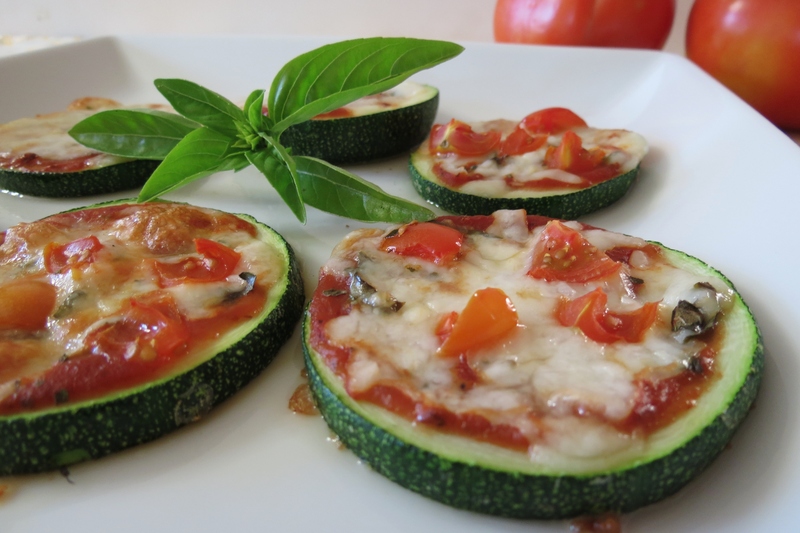 Great idea, I love this use for zucchini! These look like a perfect quick lunch or dinner – pizza anything makes me happy! Pinning this to try! This is a fabulous idea! I can’t wait to try it. Look really good and guess what? I just happen to have a zucchini in my frig!!! thanks for sharing your recipe! Anytime! I just love this recipe and I love how quick it comes together! LOVE them! Thank you for sharing on Foodie Friends Friday! Please come back and vote on Sunday! These pizzas look lovely! And they would make a great quick lunch! Thanks for sharing on Foodie Friends Friday! Thanks for having me!!! I love these little pizzas!